It's almost Fall! And, with Fall, comes rain...at least in Boston. We've had more rain over the last few days, than we've had in months. Ugh! The best (ok...only good) part about rain, you ask? Cute rain boots, of course! Here are two very similar options that are almost identical in looks yet far from identical in price. Which boot do you prefer? 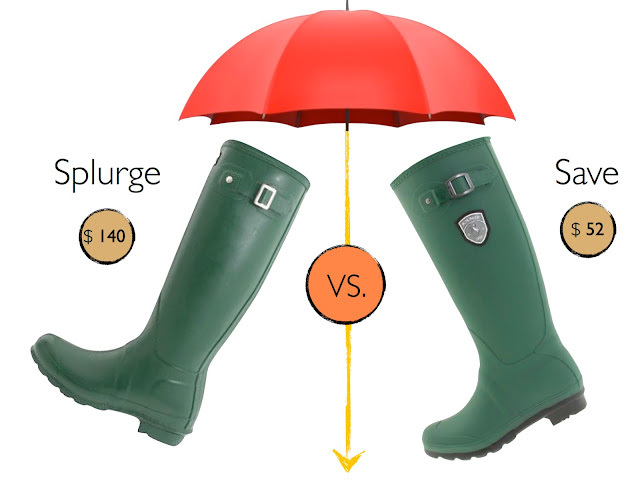 The quintessential preppy Hunter Boot (splurge) or the near-identical Kamik Boot (save)? Um, Hunter boots are on my, when I hit the big one, someday list. The other ones are cute, and typically I'm not a brand girl even a little bit, but there's just somethin' about those Hunters.